Through the years, organizations have developed and implemented a variety of metrics to drive employee behavior. Sometimes these metrics work as planned; sometimes they fail — in ways that impact the bottom line. In many cases, that failure is foreseeable — and preventable. 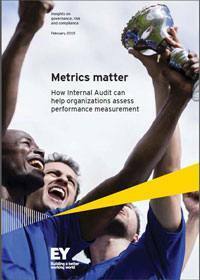 Internal Audit (IA) should help the organization not only by evaluating the processes and controls surrounding these metrics, but also by taking the natural next step and evaluating the metrics themselves. IA should use its unique knowledge of the enterprise to offer sharp insights that can directly impact the organization and its objectives. It should move beyond business process to business performance. Consider the story of one organization that recently attempted to improve the responsiveness of its IT help desk by developing a metric intended to reduce the average age of trouble tickets.